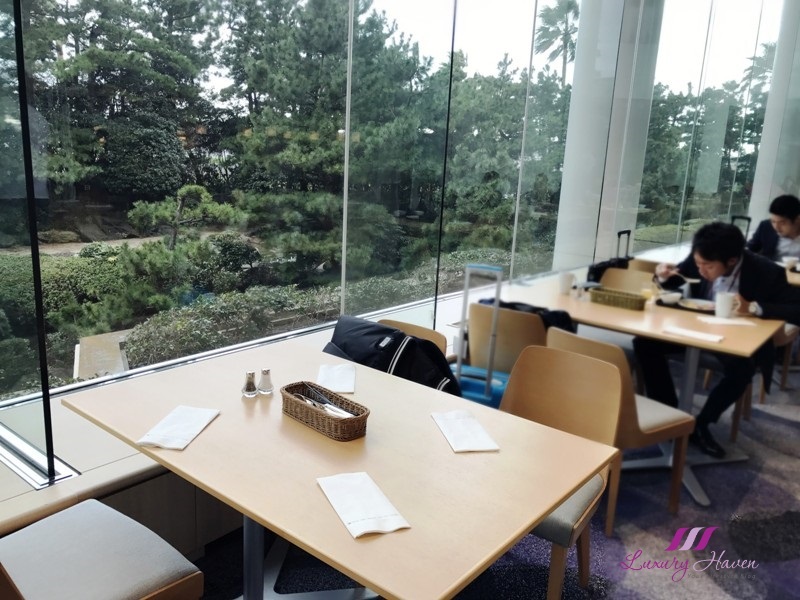 You are here:Home » Travel » Hilton Tokyo Bay Review, Disney Resort Official Hotel! Offering spectacular views of the oceanic Tokyo Bay with endless horizon is Hilton Tokyo Bay ( ヒルトン東京ベイ ), one of Tokyo Disney Resort’s official hotels. Conveniently located within the Tokyo Disney Resort, Hilton Tokyo Bay makes it so easy to explore the two theme parks – namely Tokyo Disneyland and Tokyo DisneySea, as well as the Ikspiari Mall with 4 floors of fashion outlets and restaurants. 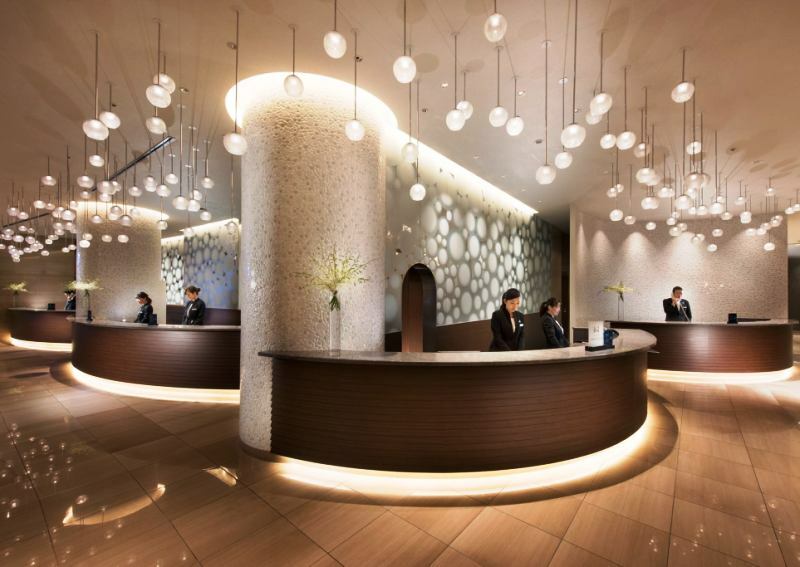 Sporting a capacious chic lobby, Hilton Tokyo Bay welcomes you with its 823 modish rooms and plush amenities, such as indoor and outdoor swimming pools, fitness centre and gymnasium, spa and massage services etc. 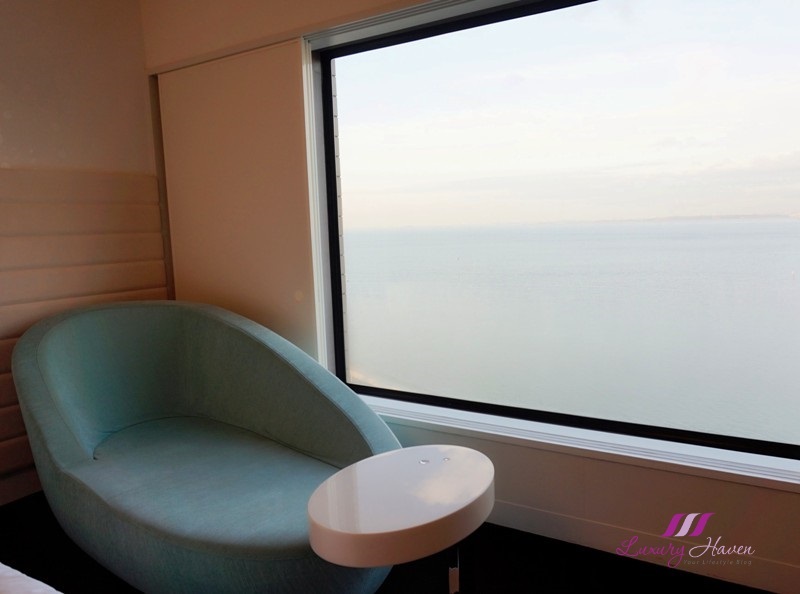 Guests can choose from a variety of rooms ranging from 35m² to 80m² with a choice of either Disney Park or Tokyo Bay views, which means that every guest room will have a great view. 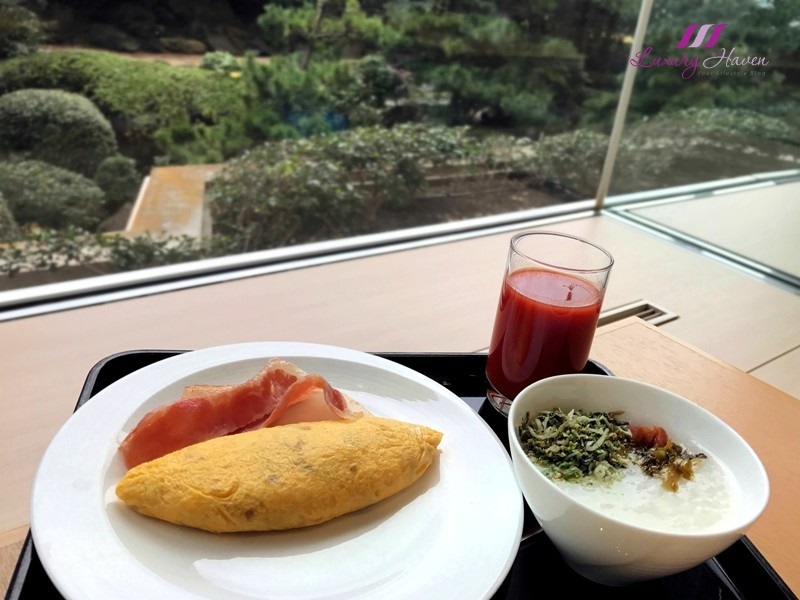 As we checked into the elegant contemporary property surrounded by greenery for my week-long vacation, we were instantly drawn into Hilton Tokyo Bay's spacious spanking new look as the hotel was given a face lift from 2008 – 2015; everything looks so clean and neat. 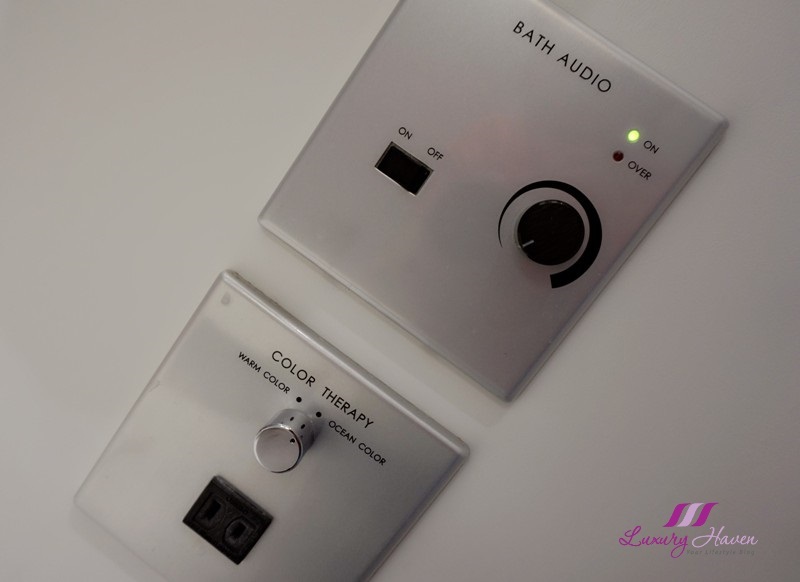 Featuring Japanese, fairy tale or pastel themes, eccentric lightings filled the hallway and colour-changing LED mood cube stools were spotted as we stepped out of the elevator on the 11th floor to our room. We were booked into their Triple-Sharing Celebrio Ocean Room, all decked out in playful touches such as soft curves and ‘ macaron ’ hues enhanced by perky colourful carpet in dark blue tone. Discover debonair touches with rooms artfully styled to reflect Disney theme. Other welcoming touches include starry lights on the headboard illuminating the room at night. Be spell-bound by stunning views overlooking the ocean from their large window, and when they say Ocean View, they really mean it! Certainly a great way to start the morning as you unwind in their lush soda-blue sofa lounger. 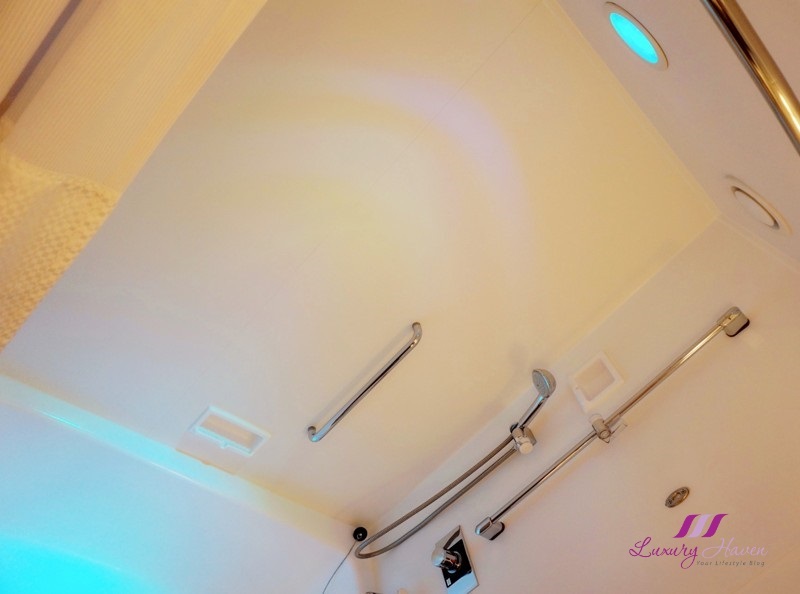 Soak up the Disney atmosphere in the hotel’s bathtub with your favourite song under the Aqua Soda Blue downlight in the bathroom to create the ultimate bath time atmosphere. The hotel seamlessly blends Disney theme and the state-of-the-art technology with its ultimate spot within the Tokyo Disney Resort. 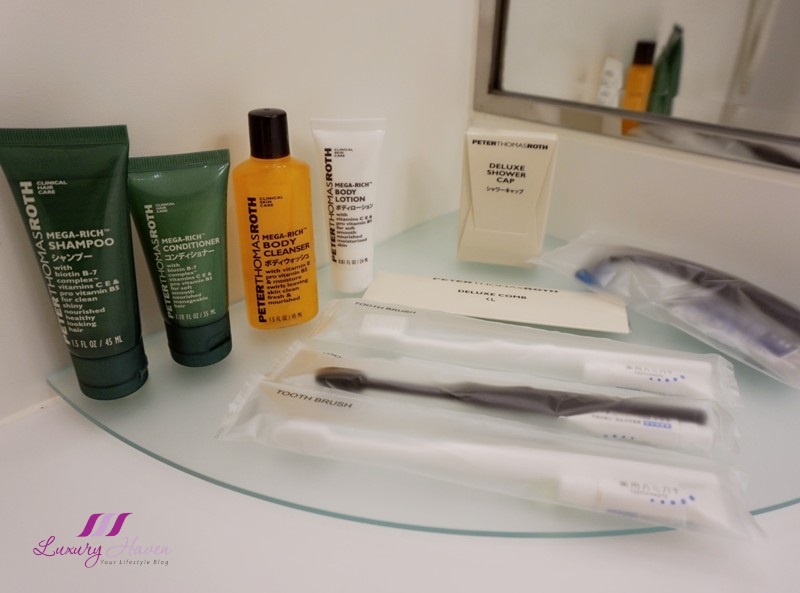 Hilton Tokyo Bay even pampers their guests with toiletries from Peter Thomas Roth, a renowned skincare brand with a comprehensive range of over 100 products sold world-wide. 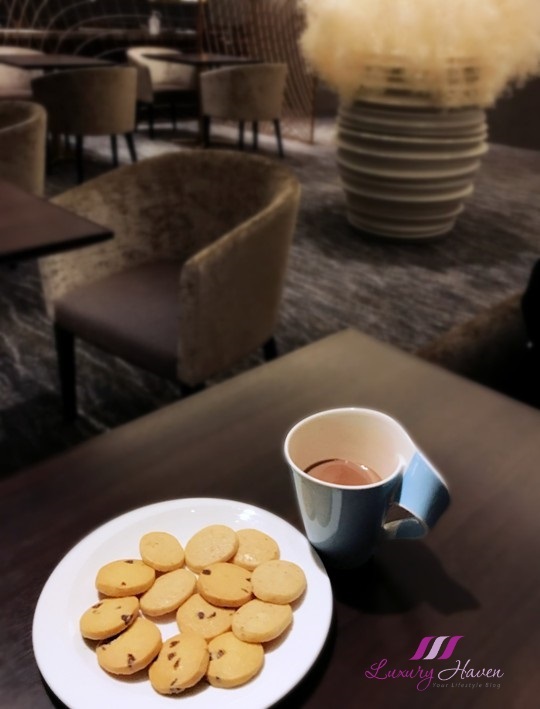 Hotel guests can enjoy complimentary WiFi and soft drinks in the in-room minibar replenished on a daily basis, other than the usual coffee / tea making facilities. We were given a choice of having our breakfast at the newly-opened cosy Celebrio Lounge with access to complimentary refreshments and evening cocktails, or at their other restaurants such as Lounge O.
Nestled right in the heart of the hotel lobby is Lounge O, bright and airy adorned with natural sunlight. Guests get to enjoy the usual spread of western breakfast with some Japanese dishes like Soba Buckwheat Noodles, Miso Soup etc. 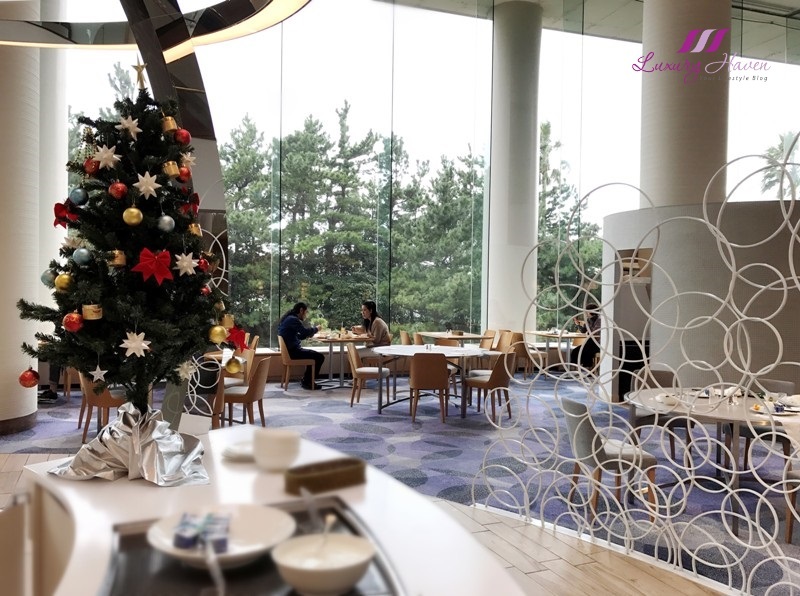 If you are dining in Lounge O, I would suggest grabbing a table next to their floor-to-ceiling windows, and indulge in the lush landscape of the hotel’s Japanese garden while enjoying your meal. We adore the well-thought gesture of having a Disney-themed Children’s Playground in the lobby area just in front of the hotel’s front desk. Guests with children can keep their kids entertained during checking-in. 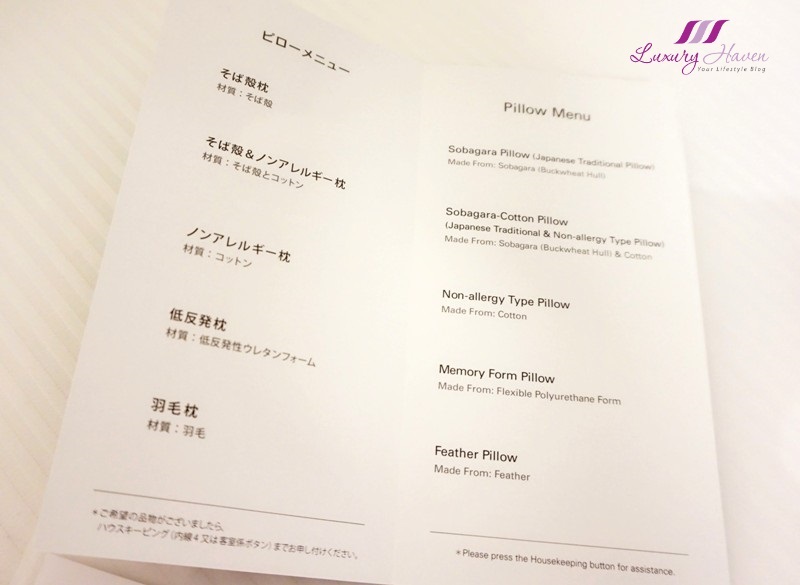 In the intimacy of your room, the sensation of comfort continues with their exclusive Pillow Menu offering a selection of Japanese-style pillows, Cotton, Feather, Memory Foam, and even Non-Allergy types. Personally, the Sobagara Buckwheat Hull and Cotton Pillow is my favourite pick with the non-allergy feature. Apparently, these popular Soba Gara pillows in Japan help you to sleep comfortably in the proper position keeping your spine in good alignment. The Celebrio Ocean Room we had has such an intoxicating view; certainly one of the best we have ever had! 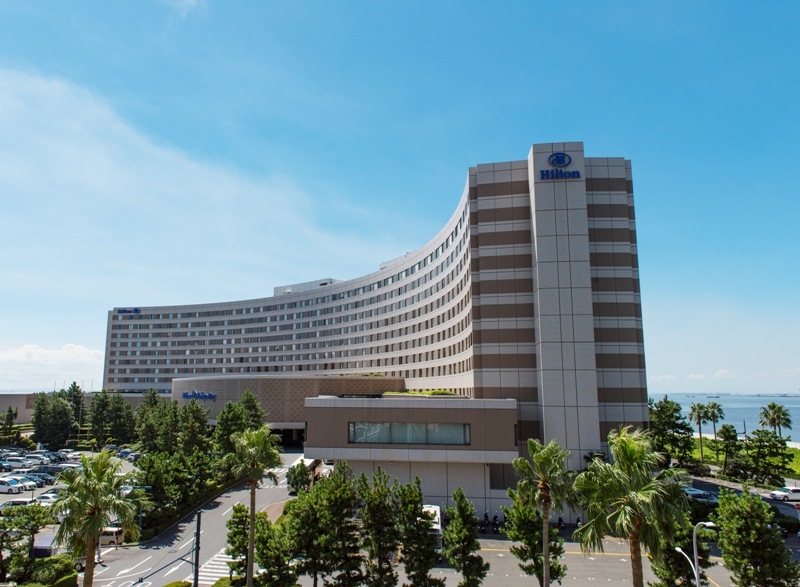 Hilton Tokyo Bay evokes a comfy feel with their clean and stylish rooms, and most importantly, well-equipped amenities. The hotel also offers complimentary internet access for its HHonors Guests, as well as guests staying at their Celebrio, Celebrio Select And Celebrio Suite Rooms. As one of the official hotels of the Tokyo Disney Resort, you will find a Disney Store and the Disney Magical Art Gallery located within the hotel itself offering more Disney shopping with merchandises that are perfect for souvenirs. There is also the Seikatsu Saika, a 24-hour Convenience Store on the lobby floor where you will find an international ATM. 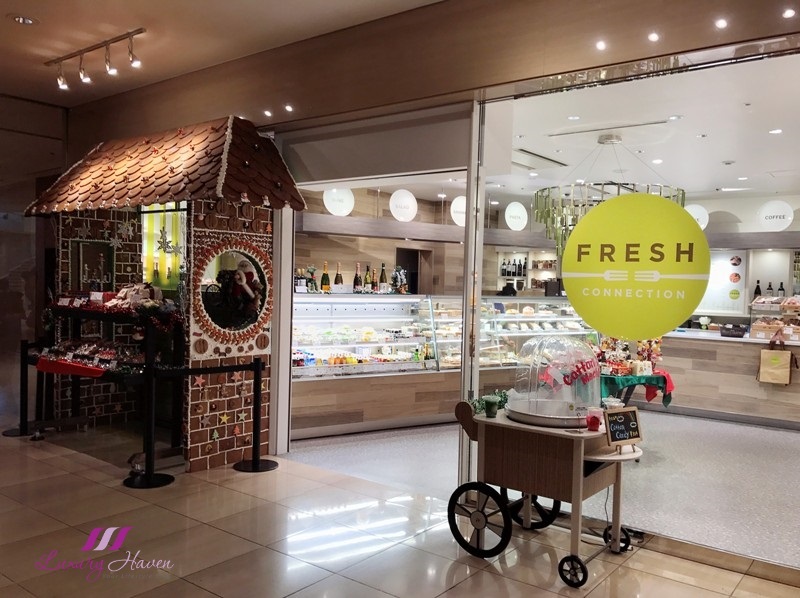 A Fresh Connection Bakery can be found in the hotel lobby, offering a spread of salads, pastas, sandwiches and pastries too. Coffee lovers will be delighted to find a Segafredo Zanetti Italian Cafe within the hotel itself. 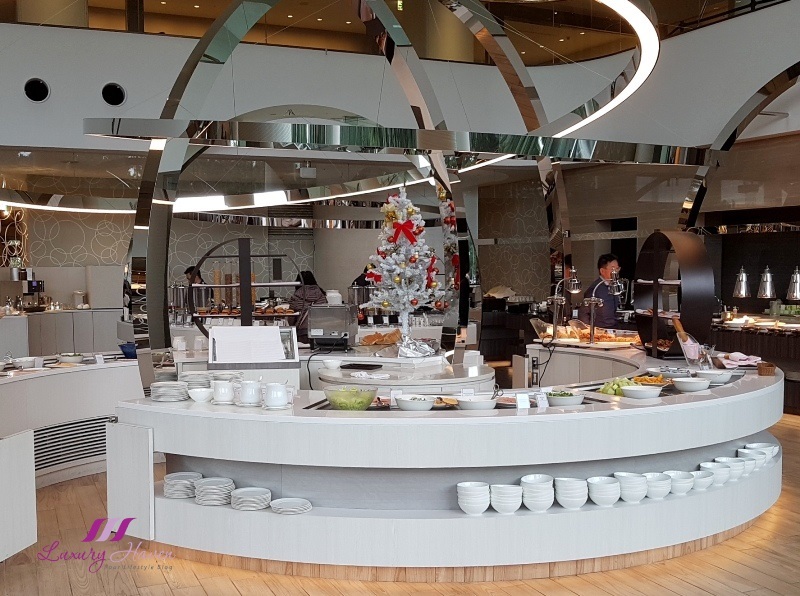 Basically, Hilton Tokyo Bay got almost everything covered under one roof. In a nutshell, we love everything about the family-friendly hotel! The size and quality of our room, the relaxed atmosphere and the eclectic mix with Disney theme incorporated into the hotel ambience, not forgetting the hotel’s strategic location with easy access to Tokyo Disney Resort and Ikspiari Mall. An Indoor Pool, coupled with a Fitness Room and Spa on the same level. Outdoor Garden Pool and Aqua Terrace surrounded by a lush Japanese garden offer a resort ambience for events. Opened only during summer period, it is an excellent venue for a pool-side buffet or BBQ party. This refreshing outdoor space is one of Tokyo Bay’s biggest garden pool and accentuates a relaxing resort ambience. 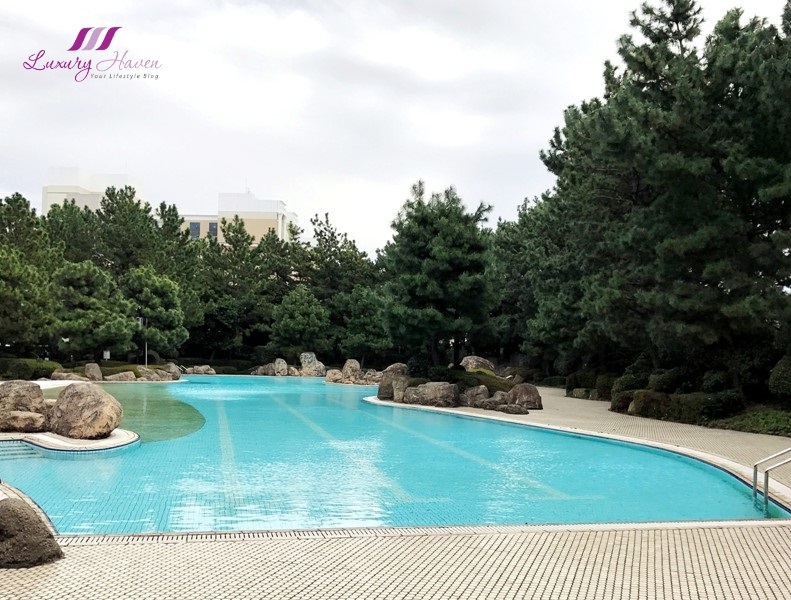 The total site area is approximately 1,600 sqm, and the 50 meter-long Garden Pool juts out dramatically with its scenic greenery. The hotel's enchanting Chapel makes a beautiful venue for weddings and a lovely backdrop for instagrammers too. Disney Shop within the hotel. Sale of tickets for Tokyo Disneyland and Tokyo DisneySea right at the hotel. Guaranteed theme park admission even during periods of restricted admission and peak visiting days. Complimentary shuttle bus service aboard the Disney Resort Cruiser is provided between the Official Hotels and Bayside Station on the Disney Resort Line. 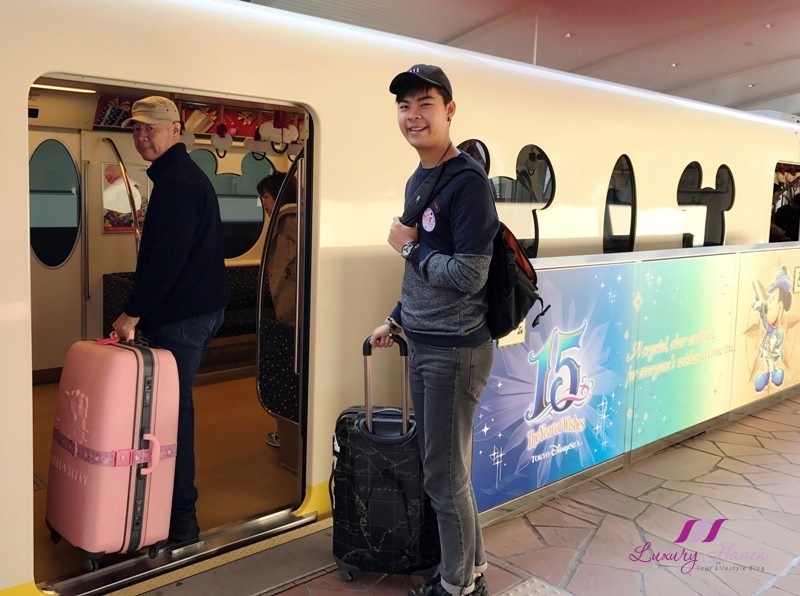 Complimentary baggage delivery service at the Tokyo Disney Resort Welcome Center ( next to JR Maihama Station ); for guests who wish to get started on their Resort vacation right away may have their belongings sent ahead to the Hotel. 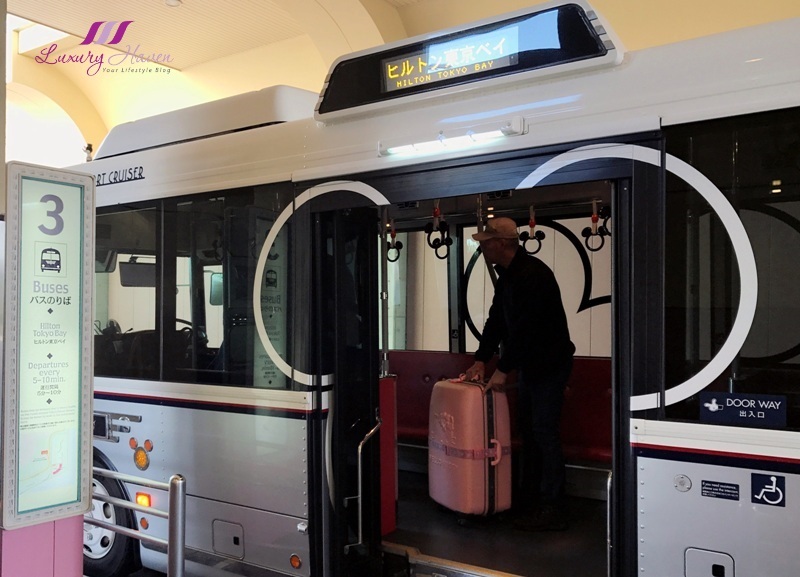 For a fee, guests can leave their baggage with the upon checking-out, and pick it up at the counter on the street level of the Tokyo Disney Resort Welcome Center. The nearest train station to Hilton Tokyo Bay is JR Maihama Station and takes only 15-20 minutes from Tokyo Station. 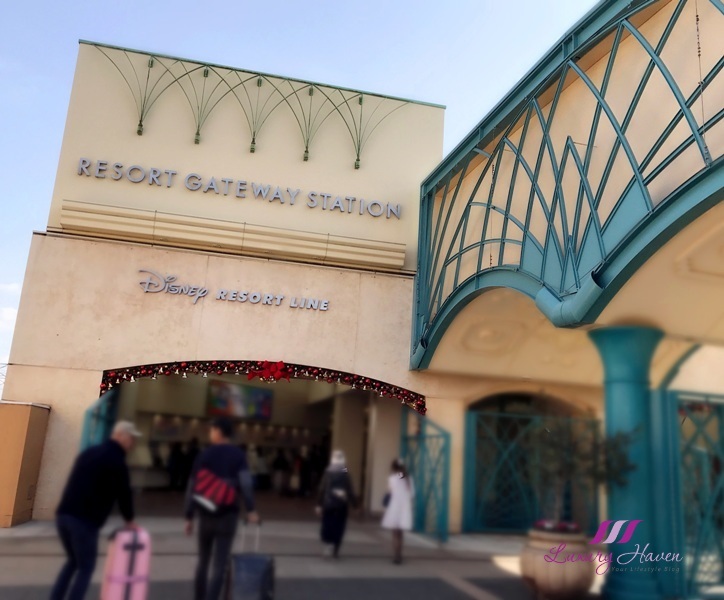 Once you have arrived at JR Maihama Station, you will see signs welcoming you to Tokyo Disney Resort. Go out from South Exit and you will find the huge Ikspiari Mall. Turn left to go to Resort Gateway Station to take the Disney Resort Line. Wait for the charming Disney Monorail. It takes about 5 minutes to reach Bayside Station where Hilton Tokyo Bay is located at. Meanwhile, whip out your camera and take your selfies or family shots! Upon arrival at the Bayside Station, go to Bay 3 and hop onto the complimentary Disney Resort Cruiser to reach Hilton Tokyo Bay! Alternatively, you can choose to have a leisure walk to the hotel which is just a stone's throw away if you do not have big luggage. 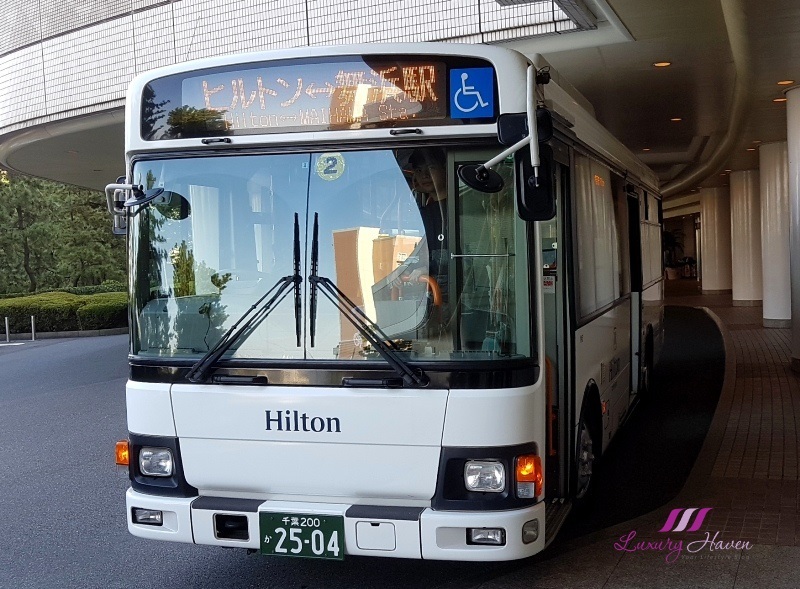 * There is also a free shuttle bus service from JR Maihama Train Station to/fro Hotel that runs daily from 6am till midnight. In essence, the cosmopolitan family-friendly hotel mixes must-see attractions, shopping paradise, spa haven and superb nightlife with fireworks in Tokyo Disney Resort, all within reach. Other nearby attractions include the Kasai Rinkai Park, Mitsui Premium Outlet Mall and Odaiba. Love designer outlet shopping? 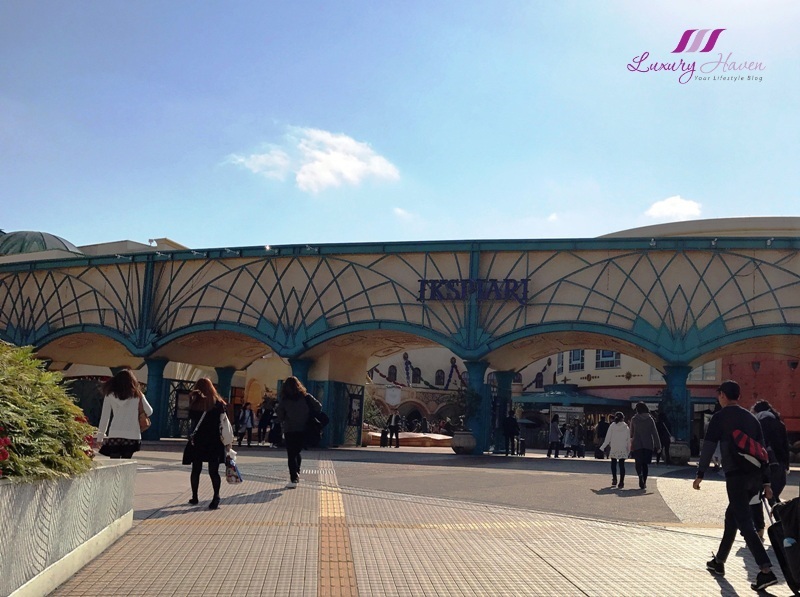 Check out what you can get at Tokyo Makuhari Outlet Shopping ( 三井アウトレットパーク幕張 )! Next stop, we were off to Tokyo Disney Resort, DisneySea 15th Anniversary the next day for our adventure! Before you go, take a look at these Amazing Instagram Shots in DisneySea, Keio Plaza, Hilton Tokyo Bay! Dynasty Restaurant Review, Hilton Tokyo Bay’s Shanghai Specialty! Dine in style at Dynasty Restaurant, a Shanghainese fine dining located in Hilton Tokyo Bay, guarantee to leave you satisfied with a full belly! 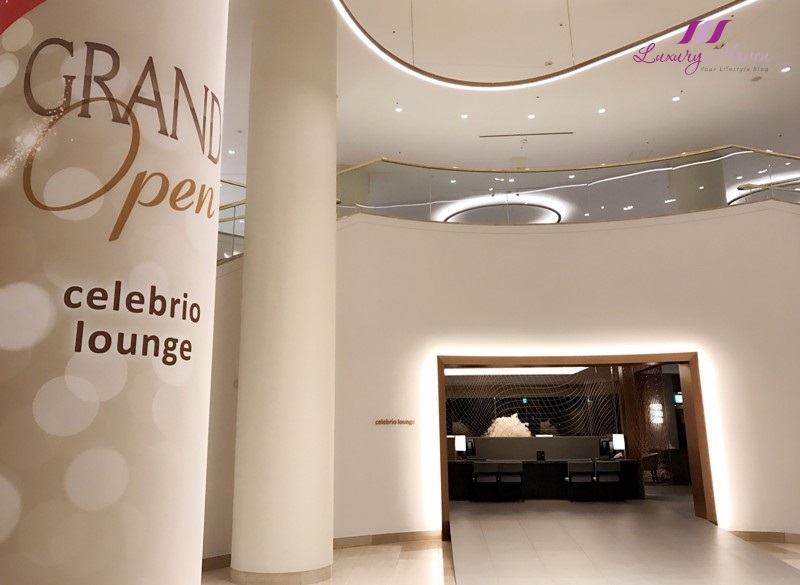 Hilton Tokyo Bay Livista: Grand Phyto Nature Spa Review! Indulge in a synergistic approach to health-care by highly-trained therapists, using special-blend oil to stimulate and strengthen our body system. * This is a sponsored post by Hilton Tokyo Bay. The author only recommends products or services she uses personally which she believes to be beneficial for her readers. Views and opinions expressed in this blog are purely by the author. The lobby alone is very, very special - such lovely interior design, and the same applies to the dining room area! 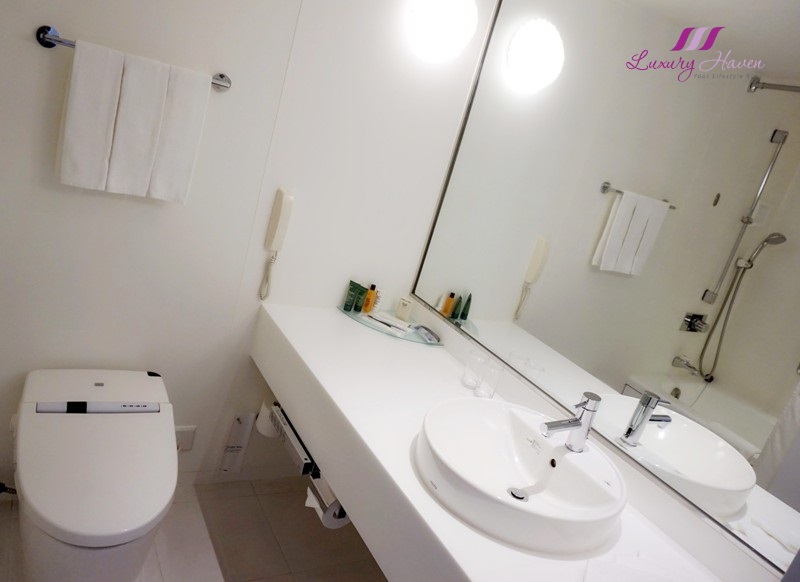 The sparkling lights surrounding your bed are so sweet :) It certainly looks as though you enjoyed your stay there! This looks like such a grand hotel experience all around! Thanks for sharing it with us! Wow drling everithing looks super amazing! Looks like a very luxury and comfortable place! Amazing interiors! Wow, it's really amazing place! Wow, this hotel is even more deluxe than the best hotel at DisneyWorld! What fun! I'm so mesmerized by this post of yours, what an awesome Disney World and it's in Japan making one wants to visit because of the shorter flight journey. what a grand hotel. 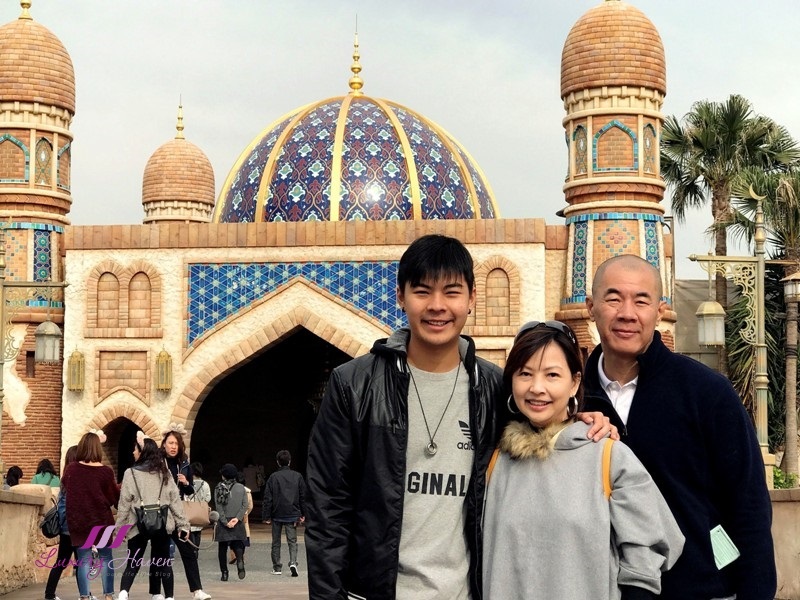 lovely photos of you and your family. It is beautiful &comfortable and the view is too nice! 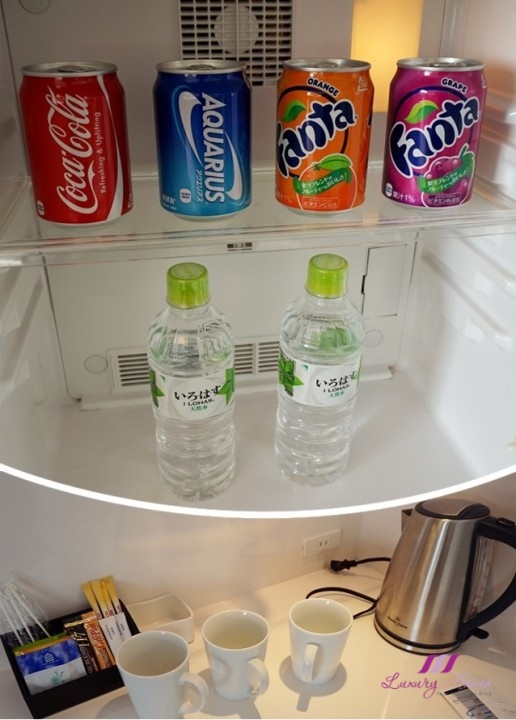 Tokyo Hilton Hotel seems like an amazing place to stay in. There are so many activities available, it is fantastic. WOW! Loved it what an adventure! Love that picture of the seat looking over the ocean. A wow factor - love the ambiance of the room and the hotel itself. Keeping my fingers crossed if I can crossed over to Hilton Tokyo in the near future. I like the starry lights on the head board, they are so beautiful. This hotel totally superb. It look comfy and so convenient too. neat place!! i thought it's also going to be decorated with disney theme inside the room haha.